When was the last time I read an epistolary novel, especially one that was written well after the advent of electricity? Can there even BE such a thing as an epistolary novel representing our modern age of emails, text messages, and social media? Love, Rosie comes pretty close. And it was quite a pleasant surprise! I first heard about the movie adaptation of this book, actually, because it stars Lily Collins and Sam Claflin, who have both portrayed major YAF characters in other movies - Clary Fray from The Mortal Instruments series and Finnick Odair from The Hunger Games trilogy, respectively. Of course I'd be interested in seeing a movie starring the two of them! But then I found out that it was based on a book, and when the opportunity came up for me to receive a review copy, I couldn't resist. Alex's family is suddenly relocated to Boston, while Rosie stays behind in Dublin, and just as she is about to join him in the States for college, she finds herself pregnant and alone, her dreams of hotel management being set aside for motherhood as Alex prepares himself for a medical career. We follow their painful saga of will-they-or-won't-they over the next few decades, as their lives take them in very different directions and they maneuver through relationships, families, and ill-timed revelations of their love for each other. Luckily, she has her family, and she has Alex - sort of. As she struggles through motherhood, Alex's trajectory skyrockets: he meets and marries another Harvard med student, just as Rosie starts to come to terms with her feelings for him. Their bad romantic timing is reminiscent of people playing phone tag, which is probably coincidental, considering that this is a story about communication and messages: Rosie herself falls in love and marries. Alex divorces his first wife. 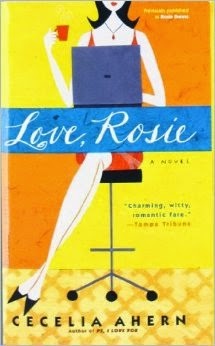 Rosie's husband Greg is cheating on her, and Alex writes her a love letter encouraging her to leave him, but Rosie never sees it, and ends up deciding to stay with him and make it work. Alex starts to reconnect with his high school ex-girlfriend Bethany (since he's working with her father, after all). Rosie decides to leave her husband and move to Boston to be near Alex. Alex starts to break things off with Bethany, but then Rosie decides to stay in Dublin after all, because Katie's father suddenly reappears and wants to reconnect with her. Alex gets back together with Bethany, almost out of anger about Rosie's decision, but also because he gets Bethany pregnant. Alex then marries Bethany. Back and forth. It's a little gut-wrenching. And my summary above is quite oversimplified - remember that this is related to us through letters, emails, chat transcripts, etc., so we're watching it unfold piece by piece. Alex's love letter to Rosie is so emotional, so lovely, and then over a series of pages we learn that Rosie never actually received the letter because Greg had intercepted it. I can't tell you how many times I shook my head and was like, OH HELL NO. It's funny, how much I was rooting for Rosie and Alex even when they were married to other people. I felt torn when Alex finally married Bethany because I understand, as an adult and a parent myself, I understand how complicated relationships can get when children are involved, and I wanted Alex to do the honorable thing and NOT ditch the mother of his child, but at the same time, I really wanted Alex and Rosie to finally get together. OH, the torture! It's made pretty abundantly clear that they are each other's soul mates, but due to bad timing and missed communication, they don't get together until the epilogue, which is finally told in traditional third-person narrative voice: through hard work and a few other things, Rosie finally ends up achieving her dream of working in hospitality. She is running her own B&B on the coast, at 50 years old, laying out and reading through all her old letters and cards, including the final one from Alex at last declaring his love for her in no uncertain terms, when he finally walks through her door to be hers forever. So, things I loved about this book: I definitely enjoyed the epistolary format. I did have to piece together a lot of things on your own and pay attention to context cues to know what was going on. I also loved that we read EVERYONE'S communication - not just between Rosie and Alex, but also between them and their siblings and parents, between their children and their children's friends, etc. And sometimes they were just Christmas card greetings or wedding invitations, but they added to the narrative as well. There was a heartbreaking series of well-wishes and such for Rosie's birthday one year where it was pretty much everyone saying, "Happy birthday! Sorry we can't be there, but we're out of town," and just to see page after page of that was really sad. I guess, you really got to experience what Rosie was experiencing, since she was the one who received all those cards. And thanks to this storytelling format, we got to meet (or hear about) some really great characters, such as Rosie's friend Ruby and Ms. Big Nose Smelly Breath Casey, who was Rosie and Alex's teacher in elementary school. We got to know these characters in a way that felt quite different from a traditional narrative voice, and it was really interesting. Things I loved less about this book: As I said earlier, I wish Rosie hadn't been saddled with so much misfortune, but it does further highlight how much of a survivor she is. She's truly a remarkable woman, but very human as well. (I'm not proud to admit that I could relate to her feelings about Slutty Bethany.) There were a couple moments where I wasn't sure if it was formatting error in my e-book or not, but I did get confused when I saw a couple letters repeated. Maybe if I had a physical copy, I could investigate whether that was a mistake or whether it was purposeful (because the events in between the repeated letter were quite significant). I definitely recommend this book. The format alone made it incredibly compelling, and if you're a sucker for a good story about life-long friendship and love, you'll really like this one. PS - I haven't quite decided if I'm going to watch the movie yet. On the one hand, I love Lily Collins and Sam Claflin, but on the other hand, it looks like they had to alter some essential details. If I do, I'll definitely write it up.